Rainford Tennis Club is delighted to welcome a group of tennis players from Ghana, who are training at the Jubilee Recreation Ground ahead of next week’s Liverpool International Tennis Tournament. Japeth Bagerbaseh and Albert Arthur, along with their coach Noah , have officially joined the Green Army and will be using our facilities over the coming weeks during their time in England. The players are competing at the annual tournament at CalderstonesPark thanks to the support of the Sam Jalloh Sports Foundation, who have been working to help develop tennis opportunities in Ghana. “We are delighted to welcome Japeth, Albert and Coach Noah to Rainford and are really please they have chosen to be part of our Club” said Director of Tennis, Steve Vincent. “Although both players have already represented their country at an international level in competitions across Africa, this will be the first time they will ever have played in Europe” said Sam Jalloh, who is also Head Coach at Rainford Tennis Club. 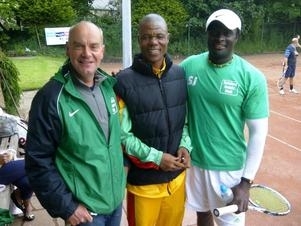 Both Steve and Sam are pictured welcoming Coach Noah at the Jubilee Recreation Ground on their arrival on Merseyside.